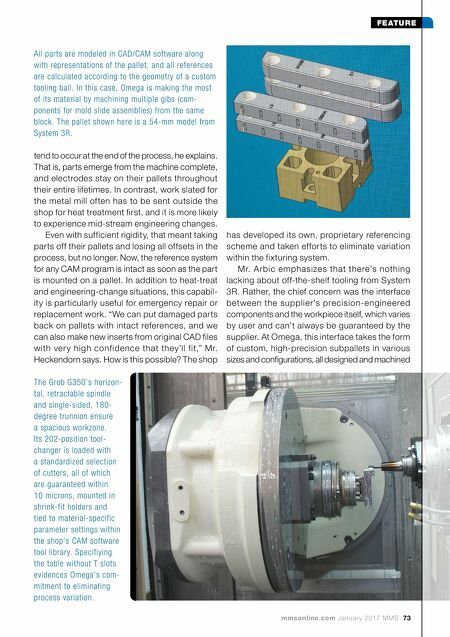 72 MMS January 2017 mmsonline.com FEATURE expanded its stable of "a la car te" ser vices to include low- to mid-volume production tools, components, molding and assemblies, but high- end prototyping/development and bridge tools still constitute the bulk of the approximately 450 molds produced annually at Omega, Mr. Heck- endorn says. Complex by prototyping standards, this tooling produces plastic parts to final spec- ifications, but only a few at a time at most, whereas the more feature-rich production mold might churn out 30, 60 or even upwards of 100 parts per cycle. Such low-cavity work provides little opportunity to machine parts in any significant volume. One exception to that rule is perhaps the most obvious target for automation at any mold shop: graphite EDM electrodes (Omega produces about 40 per day). Given the labor involved with swap- ping these components in and out of the tool- changer, the shop's ram EDM was the first to be integrated with a Workmaster carousel robot purchased from System 3R (a division of GF Machining Solutions) in 2003. Next came a three- axis graphite-machining mill that, once integrated with the robot, could keep the EDM fed with enough electrodes for an entire weekend of completely unattended production. Before long, Omega was taking on additional electrode work from other shops rather than outsourcing its own. However, the team still wasn't satisfied. 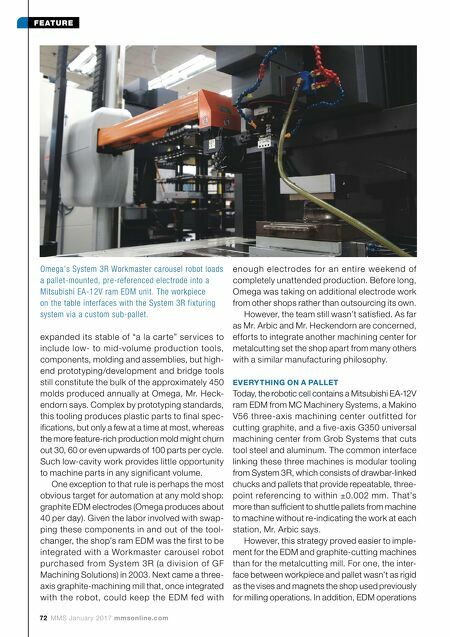 As far as Mr. Arbic and Mr. Heckendorn are concerned, efforts to integrate another machining center for metalcutting set the shop apart from many others with a similar manufacturing philosophy. EVERYTHING ON A PALLET Today, the robotic cell contains a Mitsubishi EA-12V ram EDM from MC Machinery Systems, a Makino V56 three-a xis machining center outfitted for cutting graphite, and a five-axis G350 universal machining center from Grob Systems that cuts tool steel and aluminum. The common interface linking these three machines is modular tooling from System 3R, which consists of drawbar-linked chucks and pallets that provide repeatable, three- point referencing to within ±0.002 mm. That's more than sufficient to shuttle pallets from machine to machine without re-indicating the work at each station, Mr. Arbic says. However, this strategy proved easier to imple- ment for the EDM and graphite-cutting machines than for the metalcutting mill. For one, the inter- face between workpiece and pallet wasn't as rigid as the vises and magnets the shop used previously for milling operations. In addition, EDM operations Omega's System 3R Workmaster carousel robot loads a pallet-mounted, pre-referenced electrode into a Mitsubishi EA-12V ram EDM unit. The workpiece on the table interfaces with the System 3R fixturing system via a custom sub-pallet.